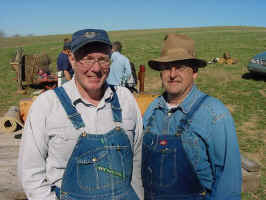 We attended the 2010 Annual Bevel Brothers Over the Log Shoot this year again on October 22, 2006. 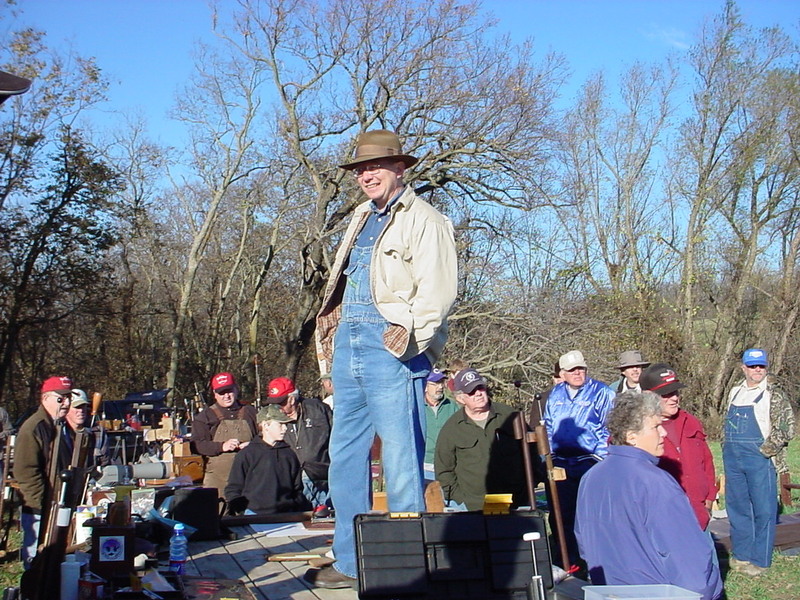 44 shooters showed up and displayed their sighters down range. Shooters came from all over the U.S.
We showed up at the range before sunrise and there were chunks and logs already set up for the day's shoot. To the right is my "Re-Beka" ready for the shoot. Shooters were all lined up and took their shots that day. Although it looked like rain, the day turned out to be a good weather day after all. To the right, "Angus" Leonard is sighting in his sighter. He is the shooter in the center with the light tan hat. Up and down we walked 10 times for the 10 shots. 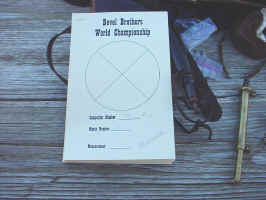 To the right and below were the prizes. When the dust finally settled, the 2010 winner was Tim Turnbow. He shot a 3.401" group. Let's not forget the famous Apple Dumplings for everyone. With ice cream of course. For entertainment, everyone got a chance to shoot an inline rifle (literally). 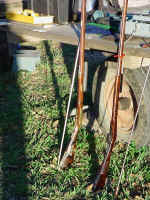 A rifle was taken down range and suspended. 3 Second Movie of rifle being shot. Here is what was left of the rifle. Some one hit the barrel square and bored a hole halfway into the barrel. We attended the 2006 Annual Bevel Brothers Over the Log Shoot this year again on October 28, 2006. 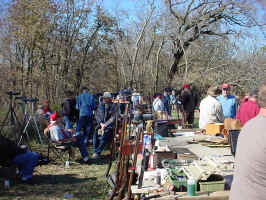 51 shooters showed up and displayed their sighters down range. 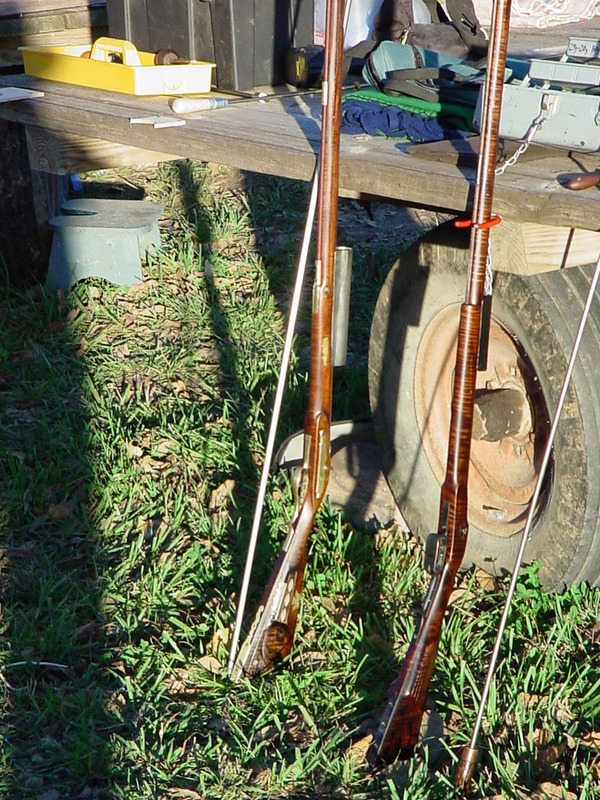 We showed up at the range before sunrise and there were chunks and logs already set up for the day's shoot. Real-estate was valuable that day on the firing line. I had "Re-Becka" set up for the chunk shoot and ready to go. Many of my old and new friends were there. Did not do well in the shoot. Did not discipline myself to hold the gun steady. Had 5 good shots and 5 just outside the 2" ring. Oh well, had a good time. Ended up with a 12.737" total. Here is my sighter target to give you an idea. "Angus" took 5th Place that day. Great Shooting my friend!! 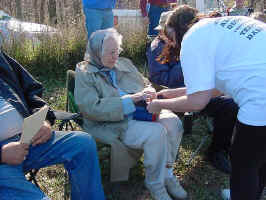 The hayrack was filled with enough prizes for everyone to make three trips to the rack to grab a prize. 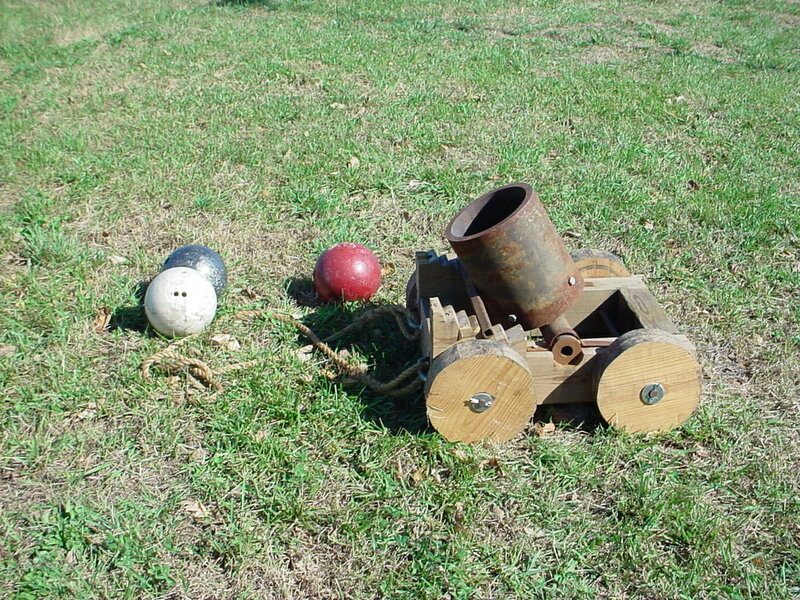 Note, I did not pick up any of the great prizes that day. There were a lot of them thou. 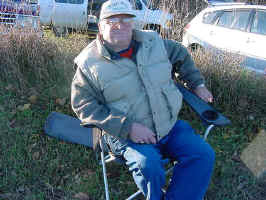 Got an email from his Grampa Charlie Bailey, who said the return 750 mile drive home to Michigan was "Priceless". 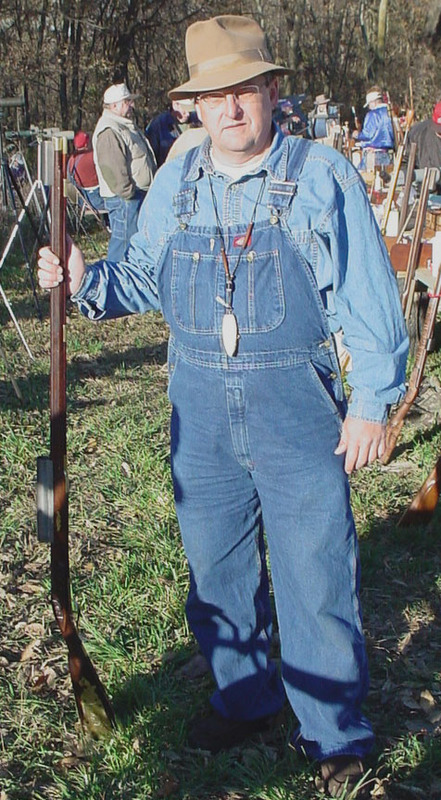 Grampa says John is all pumped up for the Alvin York shoot which is his favorite. He won the Jr. match in 2004 and 2005 and decided to go pro and shoot against the big guys in 2006. He hopes to place in the top 10 percent this spring, which is a feat in it's self considering that there are close to 225 shooters. 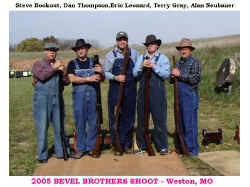 NOTE: According to Bevel Up, next year's shoot will be limited to the first 50 registered shooters. 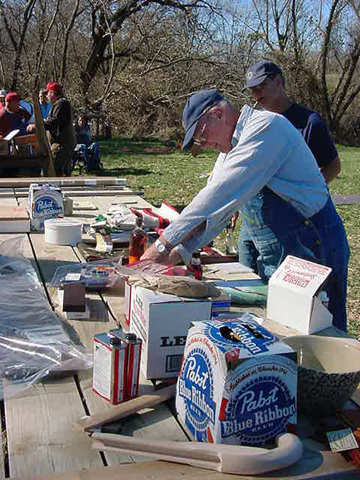 The 2nd Annual "Iowa's Original Chunk Gun Shoot" was held the end of August. I took "Re-Becka" to the shoot and she did alright. We finished with a 12.038" accumulated score. (Not the greatest, but better than I have done before.) She almost "spidered" the target twice. The best one measured 0.101" from dead center. This earned us a genuine 2006 silver dollar for round 3. Below are the two targets. One on the left was the first shot and the right one is the 3rd shot. Four out of ten shots were within 1" of of center. She made me proud that day. I shot better than I ever had previously. 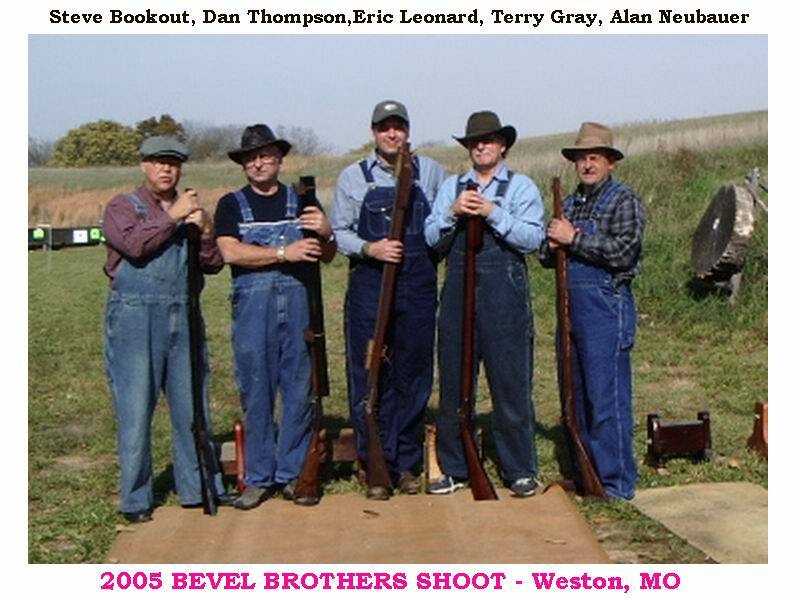 We attended the 2005 Annual Bevel Brothers Over the Log Shoot this year again on October 29, 2005. The day started off being overcast then the sun came out and warmed up with breeze out of the South. Beautiful day. Good shooting by several shooters with plenty of prizes for everyone. Eric ended up with two silver dollars and Steve got one for shooting the best X per target round. Here are few photos from that day. The shot the bowling ball mortar twice and both times shot the balls over the far hill, out of sight. Reckon 250 grains was too much powder, eh? 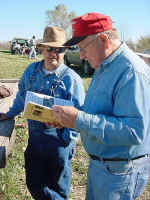 Steve "Bookie" Bookout, my friend, received an invitation to attend the 4th Annual Bevel Brother's "Over The Log" Shoot held at "Bevel Down's" farm ("Wiseacres") in Weston, MO on 10/30/04 from Bevel Up. Steve extended the invitation to Dan "Hawkman" Thompson, Eric "Angus" Leonard and myself. Never been to an over the log shoot before and we figured shortly after the shooting started we would be official "chunk gun" shooters. This turned out to be true. We had a great time and the everyone there was very cordial and willing to share their knowledge. There were several shooters present lined up along the hayracks waiting to start the shoot. Bevel Down (Joel Gard - Left photo) gathered everyone around and explained the rules for everyone prior to the shoot. 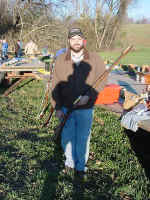 Steve intro duced me to Bevel Up (Lowell Gard - right photo). 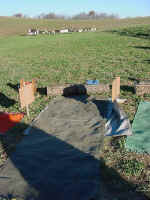 The first thing we did was find us a log and laid out our tarps on the ground. The targets (sighters) are positioned 60 yards down range from our shooting position. Now we proceed down range toward our targets. Once there, you take your first target and slide it behind your original practice (sighter) target and try to center the X of the smaller target in the area where the group of bullet holes are on your sighter target. Then everyone heads back to the firing line to take their one shot turn. No big rush or time limit. The round is over when the last person shoots their gun. The object is to take your time and make it count. 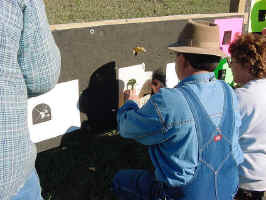 Once everyone has taken their shot, you all go down range and pull the target you just shot from behind your sighter target and replace it with another target. This continues on until you have shot 10 individual targets. The scorekeepers measure the distance from the center of the X to the center of your bullet hole. These lengths are then added up the total represents how well you shot consistently. The lower the overall length the better. I learned a new phrase that day. "Don't be a chaser!" That means don't try to move your target away from your original group of holes toward the last hole you shot into your sighter target. In other words, your chasing after your next shot. They say that is a guaranteed way to end up with a really high overall score. 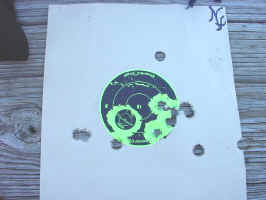 To give you an idea of what my sighter target looked like after to the shoot, I'll paste it here for you to see. I brought my rifle "Becky" and Bookie brought "Durty Nelly". After the shoot, a fine lunch was served followed with the Bevel Boys mom's church Dutch apple dumpling desert. That was a prize in it's own right and well worth the 4-1/2 hr. drive to get there for. 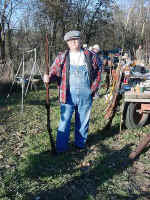 Here is photo of Mom. Prizes were set out and covered a whole hayrack. 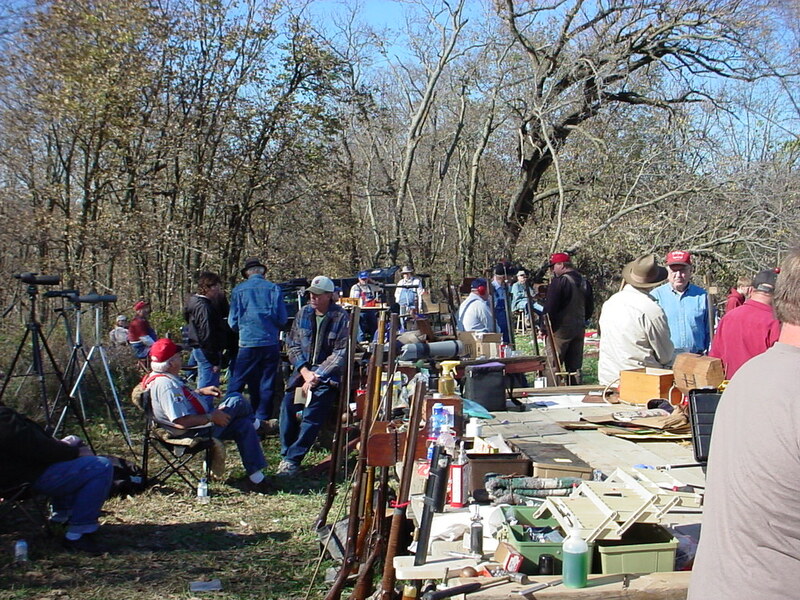 There were prizes available for all the shooters present. The Grandest prize went to the World Champion of the Over The Log Shoot. Here the winner is presented with an embroidered tie with the names of past winners, a banner and a crown. 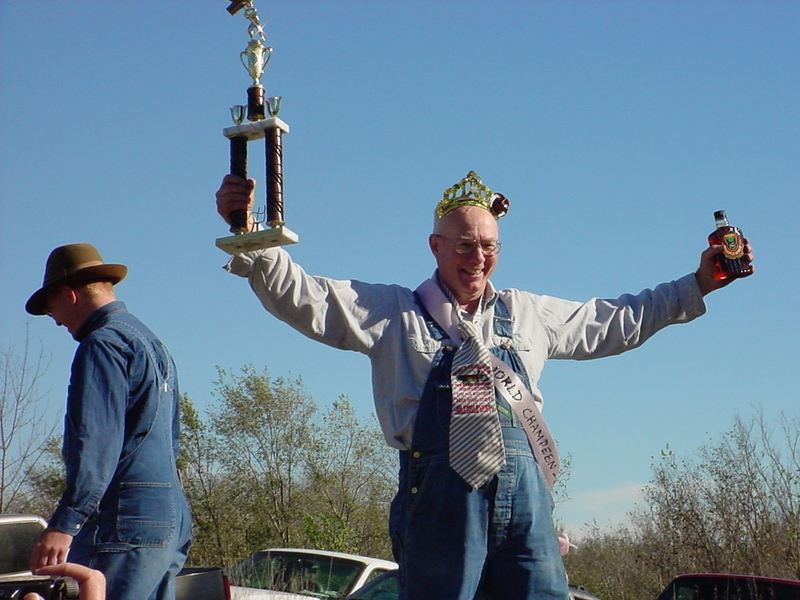 This years' winner was none other than "Bevel Down" Lowell Gard himself. He was totally surprised by the outcome. Good shooting Lowell!! 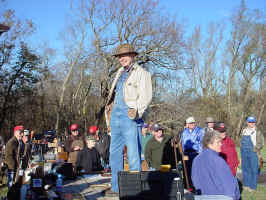 Amongst the participants was Don Getz, former owner (now retired) of Getz Barrels. Don shot pretty well that day. He came to the shoot with his son John. Don had nothing but compliments about the Rifling Bench manual Bookie and I wrote. If you like the site or have any questions, drop me a line by clicking on "Hoot" below.